In his book titled, “The Talent Code”, Daniel Coyle refers to Deep Practice as a tool to help individuals excel in their chosen field. What does Daniel Coyle mean by Deep Practice? He says that one needs to struggle and push oneself to ‘the edges of one’s ability’ to achieve the desired perfection in the field of their choice. During the course of learning, when you stumble a bit or experience a tiny bit of struggle, you practice deeper and that makes all the difference in the way you learn. So, how can we engage our employees in Deep Practice when they take eLearning courses? Including interactivities in the form of puzzles, tests or games helps employees to think deeper and make them put in that extra effort to recollect the theory they have learnt. This makes their learning deeper enabling them to retain knowledge for a longer time. According to Robert Bjork, Chair of psychology at UCLA, performance without effort and practice is not the best way to learn. He says the human brain is a scaffold of infinite size and potential. When learners encounter and overcome difficulties, they build more scaffolds and the more scaffolds they build, the faster they learn. If you provide experiences to your employees where they are given opportunities to make mistakes reflect upon them and make corrections, they are likely to learn better. Fortunately, we can design eLearning courses and create such experiences where committing mistakes and learning from them is possible without any financial liability. Assessments in the form of scenarios, situations that involve decision making and so on enable employees to reflect on their learning and use them to answer the questions in assessments. If they choose a wrong answer, they need to be given a chance to reflect on their mistakes and learn from them before moving on to the next question. Therefore, if we need to enable learners to attain the proficiency required we need to provide for Deep Practice and reflection in our programs. 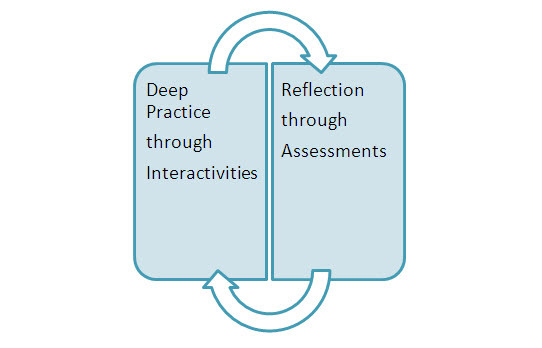 The key elements that need to be included in eLearning courses are definitely interactivities that allow for Deep Practice and assessments that encourage reflection and learning. Can you assess your eLearning experience based on these parameters and share your experience?